This month’s polls are starting to show a few intriguing trends. Labour’s average for July is currently 36.1%: a rise of 0.3 percentage points on June, and up 1.1 on May. Three separate polls in the past few days, each from a different organisation, have shown a Labour lead over the Tories of seven points. 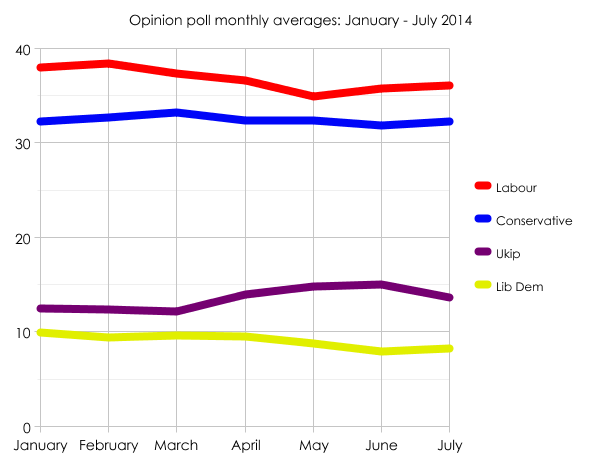 If such a trend continues, Labour’s monthly average for July will rise still further. But look at what’s happening to the ratings for the other three parties. Ukip is on 13.7%: a fall of 1.3 points on June, and the first time the party’s average has declined month-on-month since March. The Liberal Democrats are on 8.3%. That represents a rise in the party’s average for the first time since (coincidentally) March. And the Conservatives are also showing a small increase. Their current average of 32.3% reverses the slight fall they registered last month. What could be happening here? Do these trends represent the start of something significant and new? Or are the parties’ ratings merely reverting to the kind of levels we saw earlier in the year, before support for Ukip began to rise? I’m minded to go for the latter. It’s too early to say for sure, but I suspect this might be the start of Ukip’s poll average sliding gently downwards between now and next May, ending up perhaps as low as 10%. The reasons? Almost zero publicity for the party in the media after a few months of near-blanket coverage; and voters’ minds becoming less focused on past contests (the local and European elections) and more on the big contest to come. What is the margin for error on these percentages? Might a rise of 0.3 percentage points merely be statistical noise? Possibly, but that figure is based on the average of all polls conducted so far this month, so I’m minded to lend it more credence than the results of any one single poll. Well, combining the results of more than one poll should reduce the noise, but it will still be there. How do you combine them? Some sort of weighted average by sample size, or just add up the percentages and divide by the number of polls? The latter. I’m not claiming any scientific authority for my figures; I’m just interested in trends and what they may suggest. And I’m certainly not going to extrapolate anything from them about the result of the election! Brighton Pavilion: will the Greens hold on? Will there be a ‘game over’ moment before polling day?